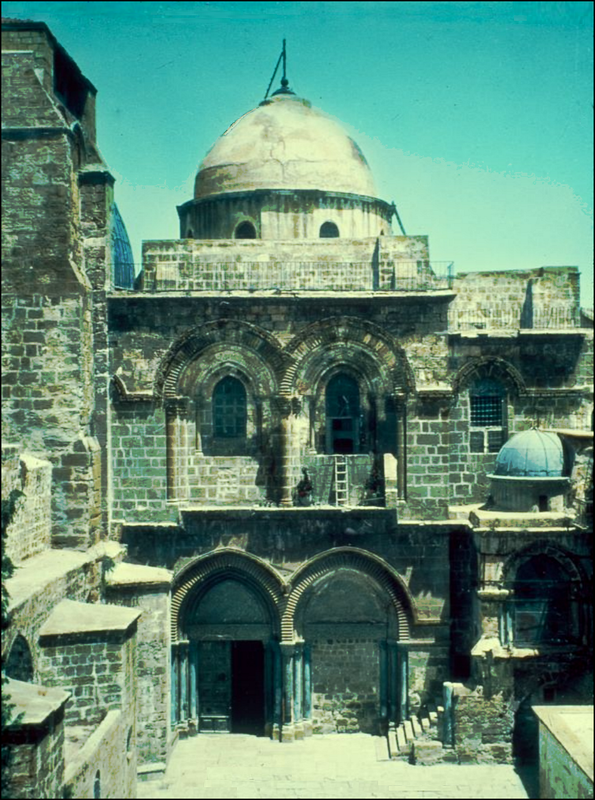 The Church of the Holy Sepulchre in Jerusalem has a long and distinguished history. A church building on its site was built in the days of Constantine, and was destroyed by Persians in 614. It was soon rebuilt, but it was set on fire in 841, and again in 935, and again in 966; finally it was thoroughly destroyed by Muslims in 1009. In 1149, fifty years after the First Crusade, the Church of the Holy Sepulchre had been rebuilt and thoroughly remodeled. It is essentially this medieval edifice, with various expansions, that can be visited today in Jerusalem. Many Christian pilgrims and tourists to Jerusalem visit the Church of the Holy Sepulchre – including President and First Lady Trump, who visited there earlier this year (2017). In addition to all its cherished pilgrimage-sites, the Church of the Holy Sepulchre is home to a small collection of New Testament manuscripts. A Gospels-manuscript, GA 1358, is there; this manuscript used to be cited as if it supports the reading of Codex Bezae in Mark 1:41 (where Codex Bezae famously says that Jesus became furious , rather than that He was filled with compassion) – but in 2011, researcher Jeff Cate showed that the text of Mark 1:41 in 1358 has merely been conformed to the parallel account in Matthew, stating neither that Jesus was filled with compassion nor that He was angry. 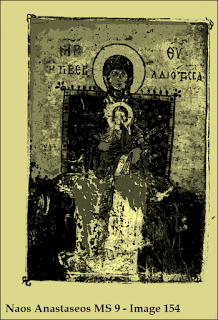 The Library of Congress recently released microfilm page-views of GA 1358 – Naos Anastaseos 15. 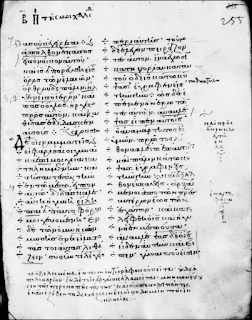 This manuscript, about 1000 years old, contains not only the text of the four Gospels but also book-introductions by Cosmas Indicopleustes (a writer of the mid-500’s who is otherwise infamous for his belief that the earth is flat) – not just for Matthew, but also before Luke and before John. Beginning of Matthew. Beginning of Mark. Beginning of Luke. Beginning of John. The pericope adulterae (καὶ ἀπῆλθεν, etc.) follows John 7:52. After the end of John, this manuscript features a brief summary of apostolic history, and a description of the post-resurrection appearances of Christ recorded in the Gospels. The Naos Anastaseos (Sanctuary of the Resurrection) collection also includes nine Greek Gospels-lectionaries, most of which are very late, having been produced in the late 1500’s and early 1600’s. Two of them, however – Naos Anastaseos 11 – Evangelion (made in the 1200’s) and Naos Anastaseos 9 (made in 1152) – are much older. 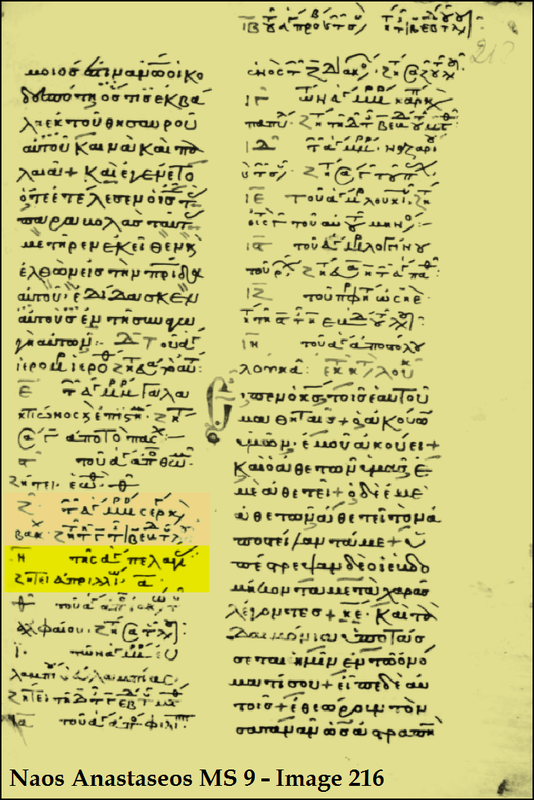 Naos Anastaseos 9 – GA Lectionary 1033 – has some particularly interesting features which render it the most significant manuscript in the collection. Its full-page picture of Mary and the Child Jesus is artistically notable, but of far more interest is its treatment of the pericope adulterae, that is, the story of the adulteress which is found in John 7:53-8:11. This passage, famously absent from the Alexandrian manuscripts that serve as the primary New Testament base-text for most modern English translations (the ESV, NIV, NLT, etc. 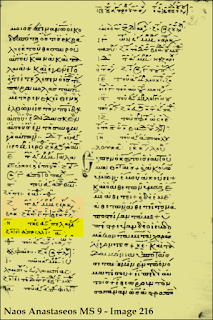 ), is present in about 85% of the extant Greek manuscripts. In one small group of manuscripts known as family-13 (also called the Ferrar group, in honor of William Hugh Ferrar, a researcher in the 1800’s who noted the close relationship of four of the main members of the group, minuscules 13, 69, 124, and 346), the story of the adulteress is not found in the Gospel of John; it is instead inserted in the Gospel of Luke after 21:38 (that is, at the end of chapter 21). This dislocation of the pericope adulterae has been confidently asserted by many commentators to be evidence that it was a “floating” composition which copyists inserted at different locations. Naos Anastaseos 9 may shine some light on this subject. Let’s look into its pages and see what we find. In most continuous-text manuscripts of the Gospel of John, John 7:53-8:11 follows John 7:52. Many manuscripts are supplemented by a lectionary-apparatus – rubrics and notes for the lector, explaining what each day’s Scripture-reading was, and where to find it (and, often, a phrase with which to start it). Typically, in the lectionary-cycle, the annual Scripture-reading, or lection, for Pentecost, a major feast-day, begins at John 7:37, and continues to the end of 7:52, but instead of stopping there, the lector is instructed to jump ahead in the text to 8:12, and read that verse, and then conclude. 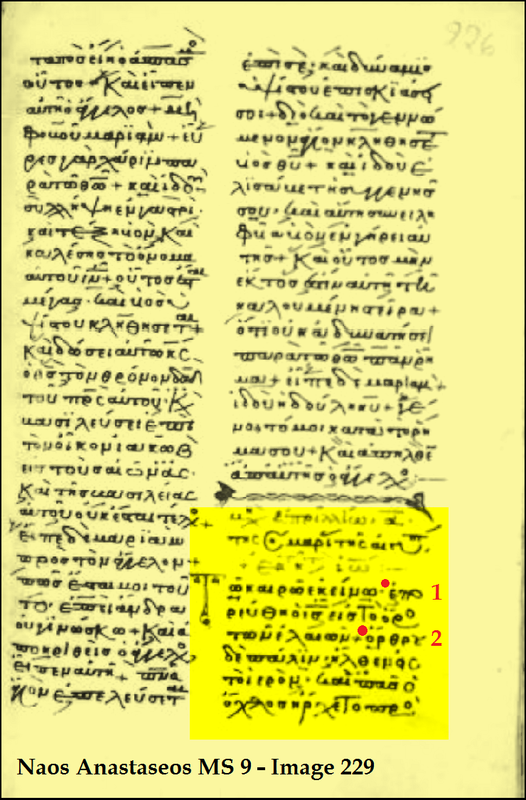 Accordingly, in Naos Anastaseos 9, we see, in the lection for Pentecost (beginning on page-view 35), no indication of the existence of John 7:53-8:11 in the Pentecost-reading; John 7:52 is followed immediately by John 8:12; nothing separates the two verses except a normal cross-symbol which routinely serves as a pause-marker. When we look in the Menologion-section of Naos Anastaseos 9 for the lection for October 8 – the feast-day of Saint Pelagia, when John 8:3-11 was typically read – we do not find the pericope adulterae there either. Instead, there is a listing which says that for the reading for St. Pelagia’s Day, seek the lection for April 1. Turning, then, to the lection for April 1, we find the lection for Saint Mary the Egyptian – and, behold, there is the text of John 8:1-11. 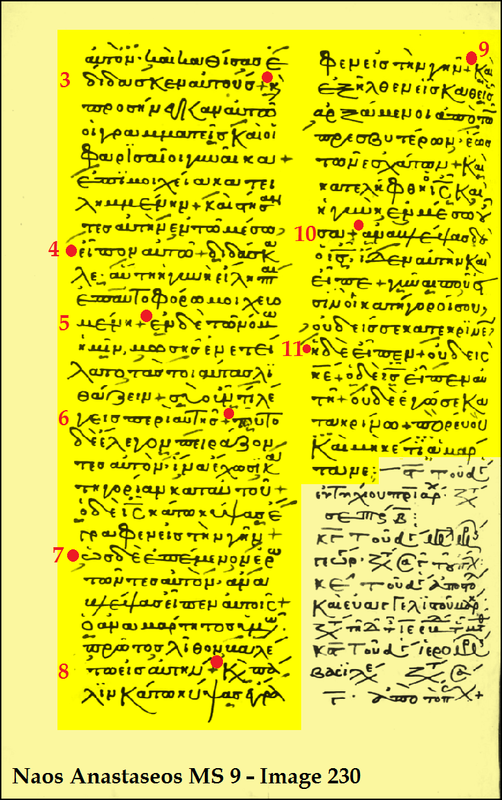 The exceptionally close correspondence between Codex Λ and the text of the lection for April 1 in Naos Anastaseos 9 suggests that the ancient manuscripts which are referred to in the Jerusalem Colophon were indeed located at Jerusalem – not Mount Sinai or Mount Athos – and were ancestors of Naos Anastaseos 9. This evidence also indicates that a note about the pericope adulterae which appears in Codex Λ, in the margin of minuscule 1424, and in minuscules 20, 215, 262, 1118, and 1187 is also referring to manuscripts at Jerusalem when it mentions ancient manuscripts which contain the pericope adulterae. (The claim that the apostles refer to the pericope adulterae reflects the annotator’s awareness of the composition known as the Apostolic Constitutions (particularly Book 2, chapter 24) (from c. 380) which, in turn, is largely based on the earlier Didascalia (from the 200’s; see pages 39-40 of Gibson’s English translation of the Didascalia). 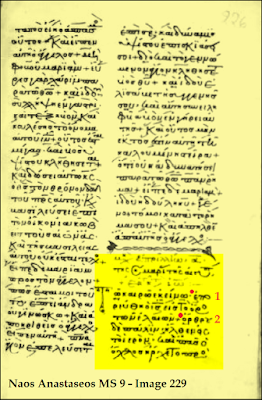 Highlighted: the note about the pericope adulterae in GA 1187, at St. Catherine’s Monastery. 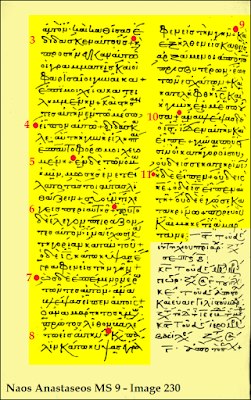 Out of the 37 Greek manuscripts that have the Jerusalem Colophon, at least five of them – 039, 262, 899, 1187, and 1555 – also consistently share some otherwise rare readings, essentially rendering them a distinct textual family. In addition, 039, 20, 262, 1118, and 1187 have the annotation about the pericope adulterae which mentions the absence of the PA in the copies of Apollinaris and the presence of the PA in ancient copies and the use of the PA in Apostolic Constitutions. Thus, in 039, 262, and 1187, both features are present. This suggests that these three witnesses are the best witnesses – along with Naos Anastaseos 9 – to the earliest strata of a small but distinct transmission-line (Wisse’s “Group Λ”). It is SO confusing trying to versify the PA. Are you sure you didn't mean 8:3-11? Buck: "Are you sure you didn't mean 8:3-11?" Snapp: "April 1, we find the lection for Saint Mary the Egyptian – and, behold, there is the text of John 8:1-11." MS L-1033 has Jn 8.1-11 as the reading for that day. Also, some 57 other lectionaries also read 8.1-11 at various Menologion locations. Of these, 6 MSS have the 8.1-11 PA at the Apr 1/Mary of Egypt location, even while 51 other MSS at Apr 1/Mary of Egypt begin the PA lection at 8.3. In other words, PA lectionary use is not limited to 8.3-11, even though that is by far the most frequent form of that lection (occurring in 432/498 lectionary MSS [87%] that have the PA present). Some things do need to be clarified--thanks, that does it. So the lection really never begins, "Once upon a time, everyone went home?" 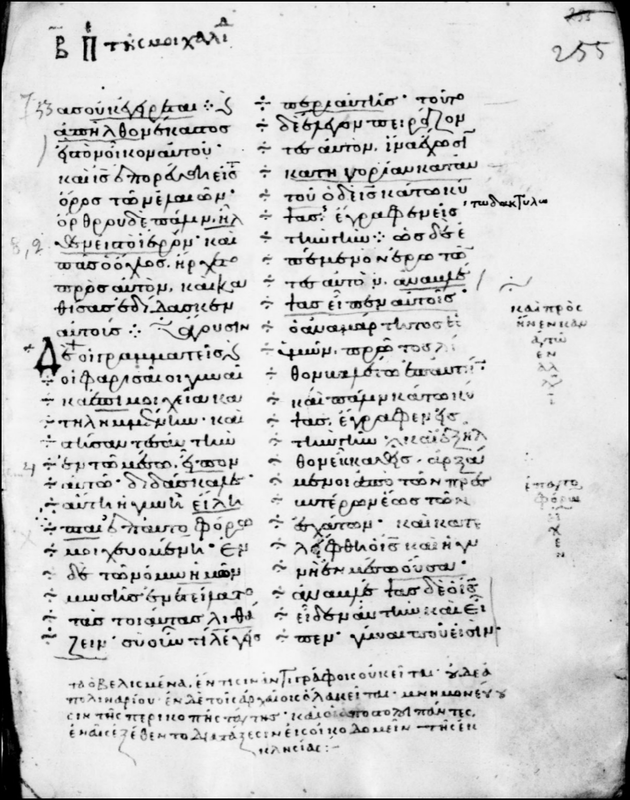 Not at all in the Menologion lections; only in 5 lectionary MSS that include the entire 7.53-8.11 passage in the Synaxarion (basically the Pentecost lesson, which normally skips from 7.52 to 8.12).